If pumpkin isn't your cup of tea, this might just change your mind! It is so super delicious that I could have finished the whole plate all by myself. Sweet little pumpkin batons covered in a crunchy curry-flavoured batter, then tossed in a spicy mayonnaise sauce. I actually made this two days in a row, and I should probably wait a while before making it again. Ahem...not exactly friendly to the waistline. The difference between the first picture above and the one below is that with the first one, I poured the mayonnaise over the pumpkin, then tossed it in the wok. That way, the fritters are coated in the creamy sauce. With the one below, I fried the mayonnaise before tossing in the pumpkin, which was what the recipe requested, and of course, the mayonnaise turned to oil. These fritters also taste fantastic on its own (without the sauce) and make a great snack. Combine batter ingredients in a mixing bowl and leave aside for 5-6 minutes. Dip pumpkin pieces in the batter and deep-fry in hot oil until golden brown. Remove from oil and set aside. Melt butter in a wok and fry curry leaves and bird's eye chillies until fragrant. Toss in the pumpkin and add mayonnaise and chilli powder. Toss well to coat the pumpkin pieces evenly. Dish out and serve immediately. Sprinkle with some dried chilli flakes if desired for extra spiciness! My friend, Joanna, was contemplating making a Vegemite Pork dish and wondered if it would work as well as Vegemite Chicken. I have tried making Vegemite Chicken before, but never attempted using pork. I guessed it would be like sweet and sour pork, but with a rich and salty base instead. Fortunately, I had a slab of pork belly in the freezer. So I started looking for recipes and found one on Kuali.com, which uses Marmite instead. I haven't eaten Marmite in a long time (not since my babyhood days when I used to have it with congee), but I think it's sweeter and milder compared to Vegemite, which tends to have a slightly more bitter aftertaste. So I added some sugar to the sauce as it packs quite a heavy punch (and probably because I decided to be generous, or too generous, with the Vegemite). I tweaked the recipe a little and tossed the meat in egg white and wheat starch flour before deep-frying. I have always wondered how the chinese restaurants manage to get their deep-fried pieces of pork so light and crunchy. I may be one step closer to achieving this (but if anyone knows the secret, please share!). I decided to whisk the egg whites until light and frothy, and then tossed the meat in wheat starch flour. That way, when it's deep-fried, the flour-covered froth will form crispy little "globules" that puff up in the hot oil as it cooks. I experimented with different types of flour, and found that tapioca flour and rice flour produce more or less the same results as wheat starch flour (which is the flour used in making har gow or crystal prawn dumplings). Combine pork with marinade for 3-4 hours or overnight in the refrigerator. Heat up oil in a wok for deep-frying. Using a fork, beat egg whites until frothy and almost doubled in volume. Dip a few slices of pork in the egg, and then toss in the wheat starch flour until coated evenly. Shake off excess flour and deep-fry the pork until golden brown and cooked. Drain on absorbent paper. Heat a little oil in a wok and add sauce ingredients. Bring to a simmering boil, then add cornflour mixture and simmer until it reduces to a thick syrupy consistency. Taste and check for seasoning.﻿ Add the pork and stir to coat evenly in the sauce for 1-2 minutes. Dish out onto a plate and serve with steamed jasmine rice. You will find many recipes for Japanese cheesecake on the internet, and most of them come from the same source, although I'm not sure where the original source is. I got mine from Diana's Desserts, which appears at the top of the list when I google it. I decided to add a touch of vanilla extract to it as well. It's a light baked cheesecake, something like a cheese chiffon, and I could easily eat a few slices at one go (I know, such a pig!). Even Z, who usually doesn't eat cakes, gobbled up a huge slice (which I was planning to share with him) within minutes. 1. Melt cream cheese, butter and milk over a double boiler. Cool the mixture. Fold in the flour, the cornflour, egg yolks, lemon juice, vanilla and salt, and mix well. 3. Add the cheese mixture to the egg white mixture and mix well. Pour into a 8-inch round cake pan (Lightly grease and line the bottom and sides of the pan with greaseproof baking paper or parchment paper). If using a springform pan, be sure to cover the outside of the pan with layers of aluminium foil to prevent water from seeping in. A soggy cheesecake is not pleasant to eat! 4. Bake cheesecake in a hot water bath for 1 hours 10 minutes or until set and golden brown at 160 degrees C (325 degrees F). Don't worry if cracks appear on top of the cake. If they start to appear, cover the top with a piece of baking paper. The cracks will close up once the cake cools down. Quick, easy and delicious. A great winter warmer, and freezes well too, so that you can have your soup ready at the touch of a microwave button. Heat the olive oil in a large saucepan, then gently cook the onions (and garlic, if used) for 5 mins, until soft but not coloured. Add the pumpkin to the pan, then carry on cooking for 8-10 mins, stirring occasionally until it starts to soften and turn golden. Pour the stock into the pan, then season with salt and pepper. Add cumin/curry powder if used. Bring to the boil, then simmer for 10 mins until the pumpkin is very soft. Pour the cream into the pan, bring back to the boil, then purée with a hand blender. The soup can now be frozen for up to 2 months. Serve hot with toasted sliced bread and pinenuts. Add a dollop of sour cream or drizzle with more olive oil, if you want. I don't cook beef very often at home (unless it's steak or meatball pasta). When I do, it's usually black pepper beef, broccoli beef or some other stir-fry concoction that comes to me as I go along. 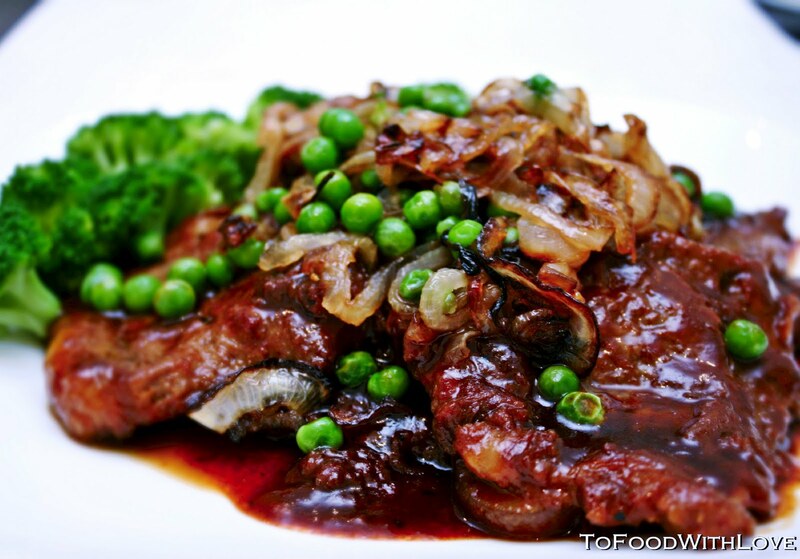 I forgot all about chinese beef steak which I used to make once in a long while, and which I simply love, especially the thick and rich gravy that is sweet, tangy and salty, and caramelized onions are so yum! I cooked the beef to medium-well with a slightly pink centre so that it's not overcooked, and yet not too underdone that the kids can't eat it. Here is the recipe. It's one that's easy to prepare and uses basic everyday pantry ingredients, so you can make it anytime. Soak the meat in the bicarb solution for 30 minutes, then drain well and discard the water. Combine meat with marinade for 1-2 hours. Heat up a little oil in a large pan or wok and fry the onions until softened. Add 1/2 tbsp sugar and pinch of salt and continue frying until browned around the edges. Add peas and fry briefly. Dish out into a bowl. Heat up 2 tbsp oil and fry the garlic cloves until browned. Remove the garlic and using the same oil, fry the beef in batches, browning them for about 1-2 minutes on both sides until they are medium-rare. Dish out onto a plate and leave aside. In the same pan, deglaze with Shaoxing wine, then add sauce ingredients and bring to a boil. Add the beef, coating them evenly and let it simmer until sauce reduces and thickens to a shiny glaze. Transfer onto a plate and top with the onion and pea mixture from Step 3. Serve hot with steamed jasmine rice. I have been craving for a burger ever since my friend, Simran, posted a most scrumptious looking photo of her mouth-watering Mini lamb burgers on A Little Yumminess. Well, lamb burgers will have to wait (although probably not for long) as my thoughts started to wander back to the time I used to enjoy these chicken schnitzel burgers with Thai Sweet Chilli at Fishbonez, a fish-and-chip shop in the Central Coast. 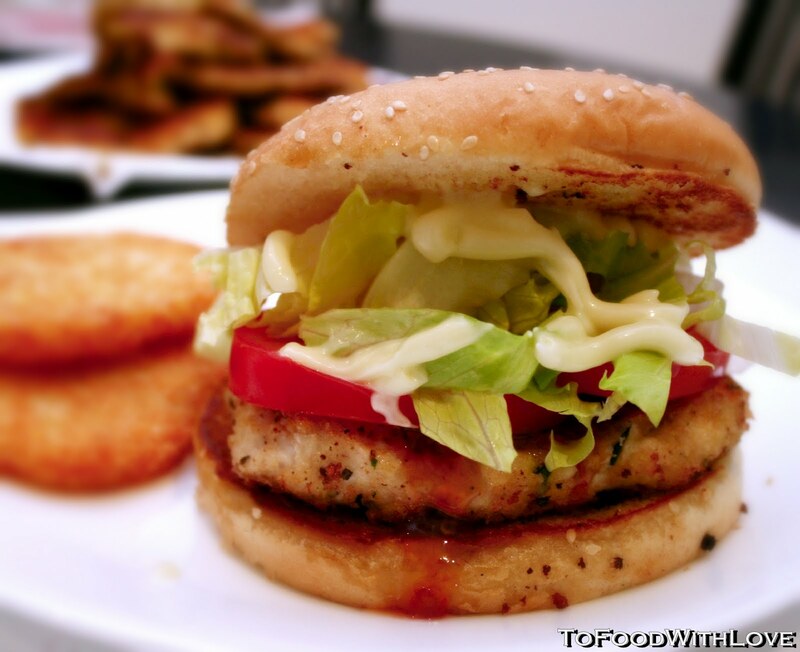 It was the first time I ever tried one, and together with the side of crunchy seasoned potato chips, it was one of the best chicken burgers I had, albeit simple. We did try making them at home a few years ago, but using frozen schnitzels, it didn't taste as good as these "from-scratch" ones I prepared last night. Making a good schnitzel isn't that difficult. Just use fresh breadcrumbs (from stale day-old bread, preferably a crusty loaf and not sandwich bread) with plenty of herbs and seasoning and you've got all the flavour you need there. I reverted to the schnitzel recipe I used in my Parmesan & Herb Crusted Chicken Schnitzel but modified it slightly by omitting the parmesan. I figured the cheese might overpower the sweet chilli, and is probably not the ideal combination of flavours either. The burger turned out really delicious, sandwiched between toasted hamburger buns, drizzled with sweet chilli and mayonnaise, topped with shredded lettuce and slices of vine-ripened truss tomatoes. For the side, I fried up some hashbrowns and served them with hot ABC chilli sauce, just like how I used to enjoy them for breakfast at McDonald's in Singapore! Try this out! It's as healthy as a burger can be, using lean chicken breast fillets, coated in fresh breadcrumbs and pan-fried, not deep-fried! They were also a winner with the kids and make a great (and healthier) alternative to chicken nuggets. Using a meat mallet, flatten the chicken into thin escallopes, from which you will get 4-5 pieces. Cut them in half if they are too big for the burger. In a food processor, combine stale bread with some parsley, rosemary and thyme, and season with a good amount of salt and pepper. Using the pulse button, process into breadcrumbs. Pour out onto a plate. Heat up about 2-3 tbsp oil in a frying pan (or enough to cover base of the pan). Dip the chicken escallope into the flour (shake off excess), then into the egg mixture, and into the breadcrumbs and coat both sides. Then dip it in egg again and back into the breadcrumbs for a double coating (optional). Throw breadcrumbs over the top and all over the chicken and press the crumbs in firmly to ensure a thick and even coating. Slowly lower the chicken into the pan and repeat the same crumbing process with the other pieces of chicken. Fry chicken on medium heat for about 4 minutes on each side till golden brown and crisp. Add more oil if necessary. Transfer to a plate when done. Assemble the burger: Top the bottom halves of the toasted hamburger buns with one or two pieces of the schnitzels, then drizzle over a generous amount of sweet chilli sauce. Top with the sliced tomatoes and shredded lettuce, squeeze some mayonnaise over, and then cover with the hamburger bun tops. Serve with chips/hashbrowns and salad. This dish reminds me of the time when I was in Singapore and used to get take-away salted fish fried rice from the local coffee shop. I always peeked inside the box to make sure that they packed some pickled green chillies to go along with it. That's just the one thing missing from last night's dinner! But still, I love the saltiness and "floury" texture of the salted fish that melts in your mouth with each mouthful of rice. 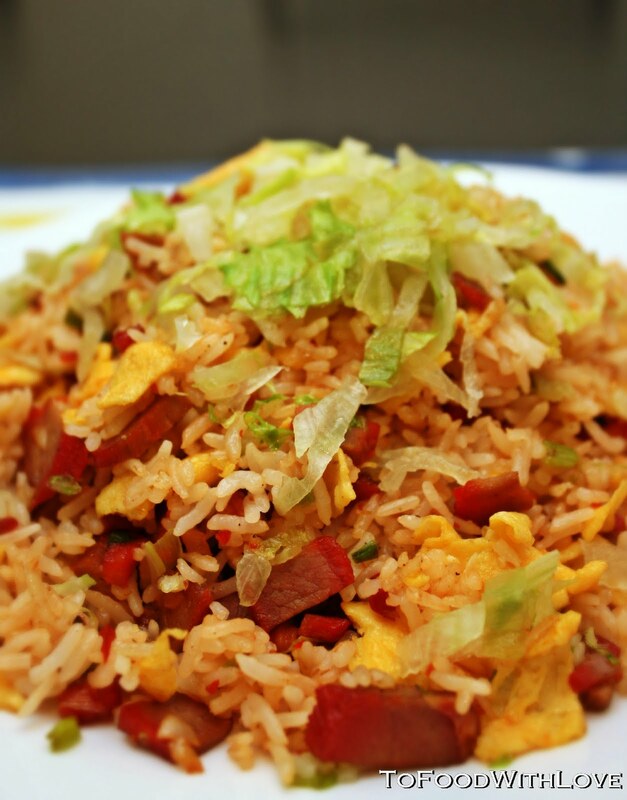 And the juicy beansprouts add a lovely crunch and freshness to the whole dish. To make it more substantial, I also tossed in some diced chicken thigh fillets, along with garlic, chopped spring onions, peas, and of course, shredded omelette. As the fish is already salty, not much seasoning is required, but just a little light soy sauce and a dash of pepper to bring out the flavours. Hmm....I really should start making some pickled green chillies soon! I was thinking of what to do with the bottle of prawn paste ("hae kor") that was left over after using it for chee cheong fun last week, and rojak came to mind. Rojak is a Malaysian fruit salad that is a combination of local fruits, vegetables and a special prawn paste mixture that is black and sticky, but utterly delicious. It's a textural dish with lots of crunch, bite and juiciness. 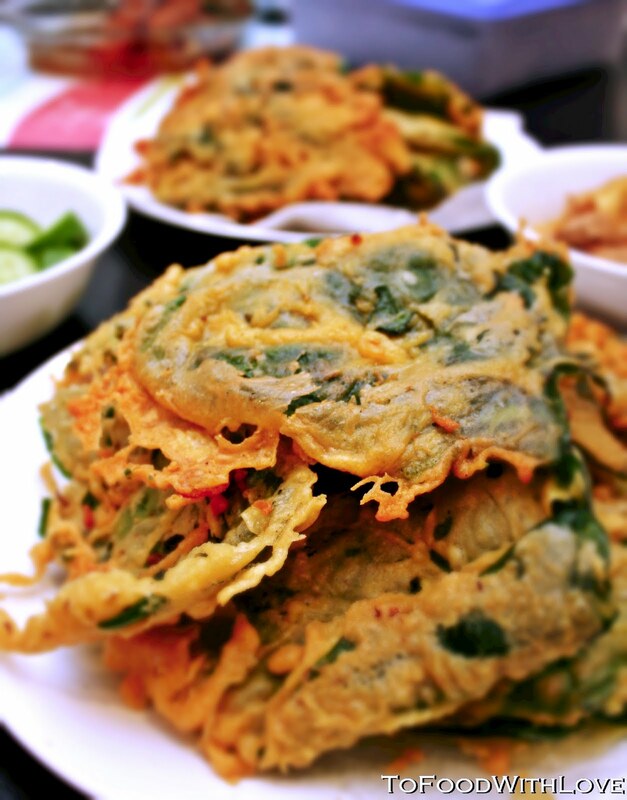 I love my rojak with chinese dough fritters ("youtiao") and water convolvulus ("kangkung"), but I didn't have any. 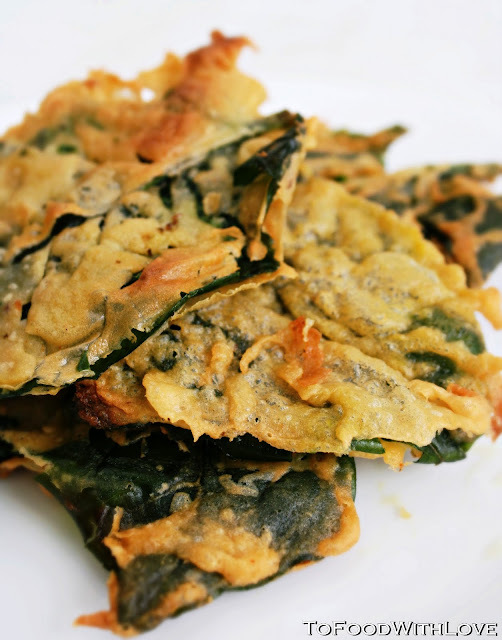 So I made some deep-fried chickpea-battered spinach leaves and used that as a substitute. Yummo! 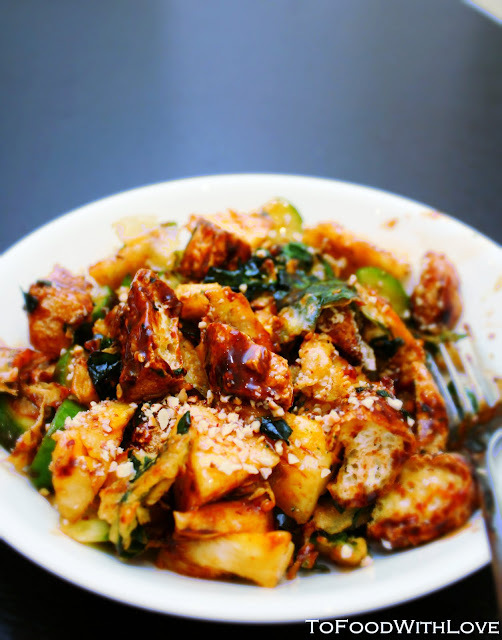 To make one serving, take 2 tbsp of CKC Sambal Rojak and mix with 1 tbsp of ground peanuts. You can add a few drops (like 1/2 tsp) of hot water if you wish so that it "mixes" better. 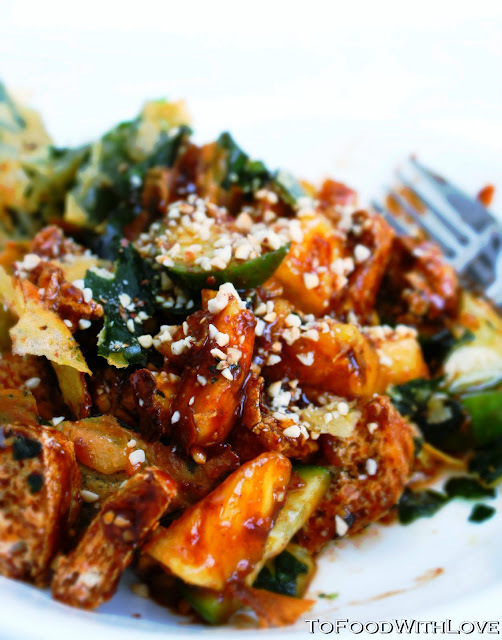 Then toss in the cucumbers, pineapple, jicama and tofu puffs and mix it around until evenly coated. Toss in the spinach and lightly mix. Transfer to a clean serving plate and sprinkle all over with ground peanuts. And it's ready to eat! Well, I just couldn't get enough of chee cheong fun last night, so I decided to make my own rice rolls today. I also made the sauce a little thicker and added some peanut butter to the hoisin mixture. And these steamed rice rolls taste even better than the store-bought ones I used yesterday. Soft, fresh and free of preservatives. Absolute yum and totally addictive! Put combined flour into a mixing bowl. Add water gradually to mix into a smooth batter. Mix in salt and oil then leave aside for one hour. Lightly grease a square pan/tin that will fit in your wok. Spoon a thin layer of the mixture into the pan and steam over rapid boiling water for 5 minutes until cooked. While still hot, use a scraper to lift and roll the sheets up immediately. Repeat with remaining batter. 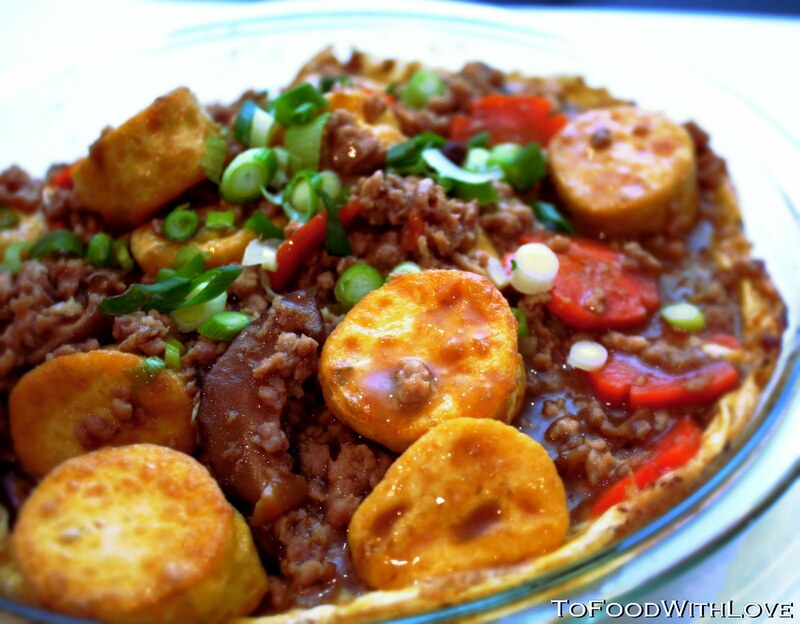 To make the sauce, refer to the previous post on Penang-style Chee Cheong Fun. What's the next best thing to eating instant noodles for a quick lunch at home? I have to say, it's Chee Cheong Fun ("CCF"). I just made two rolls for lunch yesterday, and saved the other two for G's dinner. It was super easy to make, and not having eaten this in a long time, it tasted pretty good. Of course, I just bought the ready-made rice rolls as they were far more convenient than making your own (which I have never attempted before). Update: I subsequently made steamed rice rolls from scratch! Click here for recipe. This style of CCF uses hae kor (prawn paste used in chinese rojak) and a sweet sauce, which goes really well together along with the fried shallots and dried shrimp over the rice rolls. The texture of the rolls is pretty decent, although it's nothing compared to the ones you get in Ipoh. But still, it satisfied my craving and I will definitely be making this again soon. After many attempts to make Imperial Pork ("Pai Gu Wang"), I finally came close to getting the sauce right. Over the weekend, we had lunch at a Chinese restaurant where we ordered Peking-style pork chops, and I loved the sweet sour taste of it that seemed to be a combination of black vinegar and plum sauce. So I decided to try replicating the dish for tonight's dinner, and I'm not sure whether Peking pork chops are synonymous with "Pai Gu Wang", but after having a taste of the dish I cooked, it reminded me instantly of the latter. Even G was impressed that it indeed tasted like the real thing (or almost). Cut the pork chops into 1-inch wide strips, and flatten them out with the mallet. Combine with the bicarbonate of soda solution, leave for 20 minutes and discard excess liquid. Combine pork with the marinade ingredients and leave for 4 hours. Deep fry the pork until golden brown and cooked, then drain on absorbent paper and put aside. Heat up 1/2 tbsp peanut oil in the wok, then add sauce ingredients, bring to a boil before adding the cornflour mixture. Taste and adjust for seasoning. Once sauce is slightly thickened, add the pork chops and toss them in the sauce for 1-2 minutes. Transfer to a dish and serve with steamed jasmine rice.